Ewens & Cobb were only listed once in Yeovil's trade directories and this was in 1901 when they were listed as glove manufacturers of Reckleford. Many thanks to Ted Ewens for supplying the following information on the company "It is not a happy memory in my family history. My great grandfather, Edward Samuel 'Sam' Ewens, went into partnership with his brother-in-law Alexander Henry Cobb in 1898. Cobb was a Commercial Traveller born in Ipswich in 1862. He married Sam's sister-in-law Minnie Eliza Hull in 1891. As you will see from the Cobb v Ewens court case (see below) it ended in tears. (The partnership was dissolved in December 1901) Sam lost the case and had to sell the family home "Summerlands" in Preston Road. The family view was that Cobb was a rogue and that there was a miscarriage of justice. The family were morally but not financially vindicated when the court threw out a similar case Cobb v Pittard in 1904. Cobb died in Calcutta, India in 1915. Probate was granted to the Public Trustees in 1916. After losing the Cobb case, Sam went into business with his sons Edward and Percival Charles as Ewens & Sons. This became Ewens & Co when Charles Thristle Pitcher, the son of hotelier Charles Pitcher, became a partner." Yesterday, in the Nisi Prius Court at the Somerset Assizes at Wells, Alex. Cobb, glove manufacturer, Yeovil, brought an action against Edward Samuel Ewens, also a glove manufacturer, and a brother-in-law of the plaintiff. The claim was for £750 (around £400,000 at today's value), increased with interest to £760 3s 11d, due on a promissory note, dated 24 December 1901, and payable on the 25 March 1902. Defendant admitted the note, but counter-claimed the sum of £110, which he alleged had been over-paid to the plaintiff. Lord Coleridge, KC, and Mr Garland (instructed by Messrs Marsh & Warry) appeared for the plaintiff, and Mr J Algernon Foote, KC, and Mr Holman Gregory (instructed by Messrs Watts) for the defendant. Mr Foote stated that in January 1898 plaintiff entered into partnership in the gloving trade with Ewens at Yeovil, the capital being £2,000 apiece, and to enable Cobb to come in Ewens became surety for him at the bank for £500, and Cobb borrowed another £200. This, however, was soon called in, and Ewens found this amount and took Cobb in in order to give him a start. Plaintiff knew nothing of the glove trade, having previously been a commercial traveller in the book trade. They had to establish a business, the defendant being disappointed because he did not retain the connection of the firm of Ewens & Gould. Consequently for the first two years the working resulted in a slight loss, but in the third year they made a profit of between £700 and £800. Plaintiff had heard certain rumours that at the end of the partnership term plaintiff would be kicked out of the business and defendant's son taken in. These rumours defendant denied as impossible, but from this time relations between the parties became strained, and a dissolution was ultimately agreed upon. On 26 November 1901 an agreement was drawn up signed by both defendant and plaintiff in the presence of a witness named W Abbott, by which the defendant agreed to pay Cobb the sum of £2,200 for his share in the business, £1,450 to be paid in the following December, and the remaining £750 with 5 percent interest per annum by a bill, to fall due on 25 March 1902. This sum was arrived at in the following manner :- £2,000 as plaintiff's original share in the partnership, £200 to represent his share of the goodwill and the enhanced value of the business premises, and this sum plaintiff considered fair. Plaintiff, in referring to the drawings they had made, said that last year they each drew out £150, that this year the defendant had drawn £50 more than the plaintiff had. Throughout the partnership they had been accustomed to draw £3 a week for personal expenses, but in the year 1900 they each drew £150 in addition to this, and in January 1901 they again each drew out £110. Defendant drew another £50 in March, and both partners drew a further sum of £50 in July. These drawings were not specified as prospective profits against profit. Plaintiff agreed to continue with the defendant until Christmas 1901, at a salary of £3 a week. On 24 December 1901 defendant at first refused to sign the bill stipulated in the agreement until after the accounts had been audited, but afterwards consented. On 20 January 1902 the defendant's solicitors first raised the question that the amount paid to the plaintiff was too much, and when the bill became due the amount, less £110, was tendered to the plaintiff's solicitors. The defence was that the note of hand was given in mistake. Defendant, examined by Mr Gregory, said that in November 1901 they ascertained the true value of the business, to which was added £400, and then the whole was to be divided between them. Subsequently, Cobb suggested that they should come to an amicable settlement, and to avoid expenses; and ultimately Cobb agreed to accept £2,200 as his share, he to go out of the business. On 24 December 1901 defendant paid plaintiff £1,450 and gave a three months' note for £759 7s 6d. Later he had his books audited and found he had overpaid Cobb £196 2s 9d, part of which was the £110. The amount of the purchase money and the mode of arriving at it were suggested by the plaintiff. The agreement was entered into by defendant solely on the strength of the representations made and figures supplied by Cobb. To find the value of the partnership property he (defendant) suggested that stock should be taken and an account got out, but to this the plaintiff objected on the ground that expenses would be saved by taking the figures of the last stock. Plaintiff produced the 1901 balance-sheet, which showed that the then assets were £3,829 4s 10d, and suggested that it would fairly represent the profit on the year's trading if £170 15s 2d were added to that figure. Relying upon the plaintiff's representation, defendant agreed to the value of £2,200 as the price of the plaintiff's share. Since the stocktaking of 1900, in January 1901, the sum of £110 had been withdrawn from the partnership capital by defendant and plaintiff, but as he (defendant) had nothing to do with the books that entirely escaped his memory until it was subsequently pointed out to him by his accountant. In consequence of this withdrawal, plaintiff received £110 more than his share. Lord Coleridge, on behalf of the plaintiff, maintained that this £100 was not drawn from capital, but on prospective profits. Evidence was given by Col. marsh and WW Hynder, clerk to Messrs. Watts. The jury, after five minutes' deliberation, returned a verdict for plaintiff on claim and counter-claim. The judge (Mr Justice Bucknell) said he agreed with the verdict, and judgement was entered accordingly. Costs will follow verdict. Many thanks to Ted Ewens for supplying the above newspaper clipping (newspaper unknown). 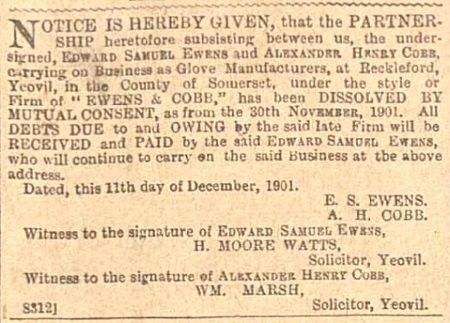 Notice of the dissolving of the partnership of Samuel Ewens and Alexander Cobb in the Western Gazette's edition of 13 December 1901.